When you visit Fix-a-Frame you will experience something special. 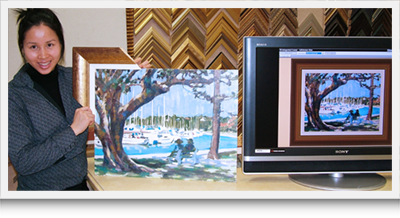 We provide custom framing by professionally trained and qualified framers who are dedicated and experienced enough to give you complete satisfaction. The staff are friendly and helpful and can provide you with the service and advice that you demand. Our extensive range of frames covers all aspects and design styles. We source our mouldings from the best manufacturers and we guarantee the quality of our workmanship. "Be totally delighted or your framing will be changed for FREE"
You will be sure to find the frame of your dreams easily as you are guided through our vast selection of frames, mattings and enhancements by expert designers. 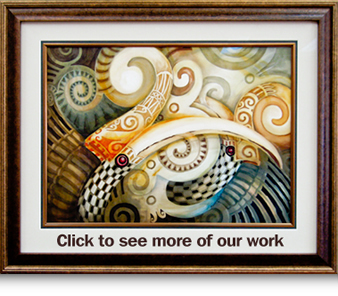 We are committed to achieving the best result when it comes to framing your pictures. Yellowish-brown burn lines are caused by acids released as the Lignin in pulp products breaks down Alum, an acidic binding agent often used in board manufacture, accelerates the breakdown. The acids cause artwork to discolour and become brittle. Air-borne pollutants combine with moisture and produce acids readily absorbed by the artwork. Pressure sensitive tapes contain solvent. If they are used for framing, the solvent will soak into the artwork. Some tapes lift from the artwork causing it to fall from the mount. Other tapes permanently bond causing damage if they ever have to be removed. Reddish brown patches caused by a combination of metallic salts, mould, high humidity and high temperatures. Moisture from condensation behind the glass promotes mould growth and can cause colours to bleed. Our design skills coupled with the latest visualisation software will allow your ideas to be realised right before your eyes. We are able to show your picture fully framed on a large screen LCD before you make your final decision. 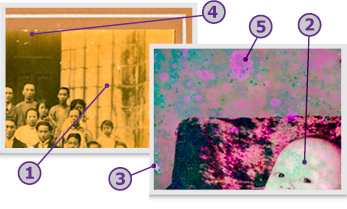 Have a look at the sequence below and see how easy it is for you to pick a frame.